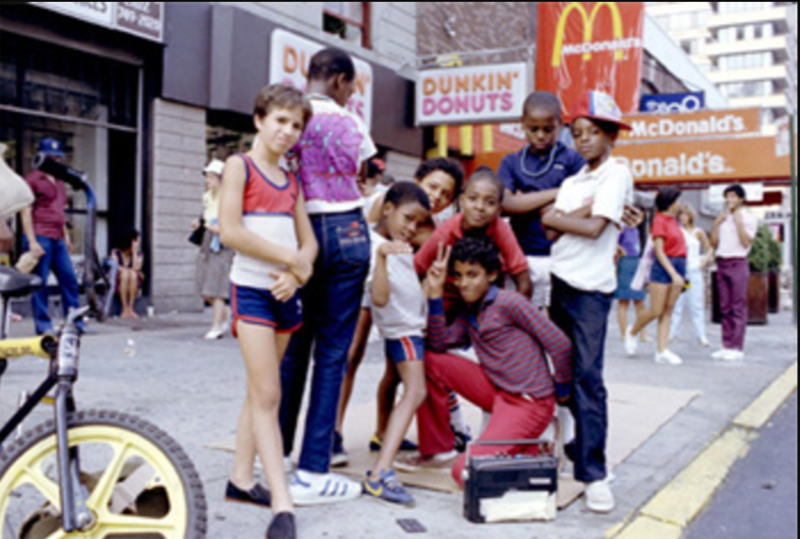 Image of 1980s B-boy kids on the Street, New York City. The emergence of Hip-Hop as a cultural phenomenon during the decade of the 1970s characterized a pivotal cultural shift in America. The Hip-Hop subculture gained momentum, and ultimately swept the music industry. Encompassed within this scene were the stylistic art forms of rap (MCing), graffiti, DJing, and B-boying. Initially, this community served as an expressive outlet for the marginalized youth of the Bronx. Hip-Hop acted as a staunch rejection of the predominant, white, patriarchal social order (Holmes-Smith 1997). B-boying – a sub-set of the Hip-Hop culture – created an environment that centered on street dance performance, and provided one of the most groundbreaking and innovative artistic forms of its time. B-boy dance forms (breakdancing) are composed of distinct breaking movements, such as toprock, downrock, power moves, and freezes. Traditionally, B-boys performed to the tune of rap, Hip-Hop, and computerized beats with a distinctive ‘scratch’ or over dubbing sound. Hip-Hop, and subsequently B-boying, incorporated related art and musical forms from Afro-Caribbean, African American, and Latino neighborhoods of the Bronx (Schloss 2009). The “Holy Trinity” of Hip-Hop music, DJ Kool Herc, Afrika Bambaataa, and Grandmaster Flash (two with Caribbean roots), all played a central role in the development of Hip-Hop at this time, bringing with them the over-dubbing of Reggae and Caribbean sound systems. From the beginning, Latinos, especially from the Caribbean, were essential in the development, dissemination, and diversification of Hip-Hop culture (Reznowski 2014). Through the use of bilingual rap, Latino artists opened doors for non-English presentations of Hip-Hop and eroded the hegemonic English language in what would become the global phenomenon of Hip-Hop (Fernandes 2011). What’s more, Latinos were central to the foundation of B-boying and “breaking” as an art form, in particular, further ingraining the “global” element of Hip-Hop and B-boying. The B-boy world functioned as a counterculture – an escape – from the traditionally oppressive society that members encountered on a daily basis. As a B-boy, dancers felt empowered and liberated from the stigma and stereotyping they faced as a result of their race and/or ethnicity (Fasting, Kari, and Langnes 2014). Despite the primarily minority-centric ethos of Hip-Hop and B-boying, this subculture rapidly spread throughout New York City as a well-recognized form of expression. By the mid-1980s to 1990s, Hip-Hop rose to mass popularity and gained substantial media exposure from artists such as Public Enemy and Run DMC. Additionally, films such as Wild Style, Beat Street, and more popularly known, Flash Dance, placed b-boying more prominently on the global mainstream stage. According to Steve Hager, the author of HipHop: The Illustrated History of Breakdancing, Rap Music, and Graffiti, “[t]his very real and vital art form created by inner-city kids became a fad,” for upper-middle class, predominantly white, teens and young adults (Hager 1984). Despite a brief fall from popularity at the end of the 1980s, B-boying again rose to prominence in mid-1990s. Not only was B-boying featured in newspapers across the boroughs (e.g. the Village Voice and NPR) during this time, it was also prevalent in both the rave scene and the original Bronx neighborhoods. The 1990s were a turning point for B-boying, as it became more widely appreciated. 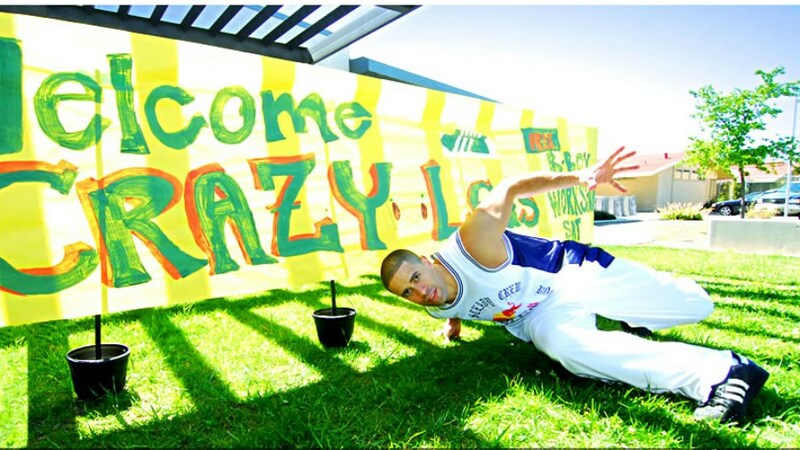 The 2000s ushered in the globalization of B-boying. International popularity soared from South Korea to Brazil, but what tied this culture together? The shared ‘vernacular’ of the culture created a sense of unity among B-boys regardless of their country. B-boys often traveled across borders to learn from one another and compete in street battles – a core element of the B-boy culture. In street battles, dancers compete against one another in a cypher (circles of people gathered around the dancers); they are, then, judged on musicality, skill, and creativity. Through these battles, B-boys established subcultural capital and developed bonds, ultimately tying the individuals and the dance to something deeper than location. “It’s all about the music,” or rather, it’s all about how the music is “mediated, negotiated, and competed over” in the various B-boy arenas (Fogarty 2011). In addition to the globalization of B-boying, the 2000s also brought the dawn of the Internet, and major changes in the B-boy community; like many other aspects of society, the Internet greatly its altered the dynamic. The launch of MTV, and later, the start of So You Think You Can Dance (and similar TV shows), popularized B-boying and the breakdancing art form to a level it had never previously encountered. The commodification, commercialization, and dissemination of the “classic B-boy image” disassociated any specific identity markers with the B-boy and assimilated the image of B-boying into the teenage market (Kong 2010). Today, “there is NO way to dress as a B-boy. B-boying is what you do and who you are, not how you dress” (B-boy.org 2010). Despite this attitude, many brands, dance shows (i.e. America’s Best Dance Crew), and B-boy groups have started their own clothing lines catering to the “classic B-boy image” thus reducing break dancers to the one-dimensional costume of ‘street dancer’ rather than appreciating the lifestyle that is B-boying. Ultimately, the commercialization and media hype around B-boying served to both discredit and further ingrain authenticity structures. The judges on dance shows and sensationalized B-boy crews “[played] a crucial role in authenticating street dance for the American public and in shaping the American dance aesthetic” (Kong 2010). This led to the establishment of a specific image and ideology of B-boy in the American mind, discrediting the diversity within the culture and instilling a distinct mold that B-boys, at times, struggled to fit. However, the dawn of the Internet did not only beckon in negative effects for the B-boying community; social media brought a new creative outlet for artistic expression and communication. YouTube and other social media platforms allowed for conversations between B-boys around the world, resulting in a global exchange of knowledge, perspective, and subcultural capital. Today, YouTube is a primary platform for watching B-boying on an international stage. The use of YouTube and other social media platforms for isolated viewing of B-boy performance demonstrates a break from traditional viewing practices. As opposed to the communal observation, praise, and criticism of a performance that occurred during the early years of B-boying, people now view this art form from the comfort of their own homes (Kong 2010). This individualization of the B-boy scene (both in viewing and performing) led to questions of authenticity, specifically, who has the knowledge and capital to identify as a “real” B-boy. B-boys are, thus, forced to continually reassert their authenticity and reputation through dance battles. Ken “Ken Swift” Gabbert, known worldwide as the “epitome of a B-boy”, explains the significance of the dance battle as a history revealing process. A dancer reveals their history to themselves and those around them when they enter the dance circle. Dancers conduct impression management through their movements, musical tastes, and “local and mediated influences,” to portray a genuine self and B-boy image, thus heightening the stakes of authentication (Fogarty 2010). Through its evolution within the Hip-Hop world, b-boying enjoys a symbiotic relationship with graffiti, rap, DJing, and the various other manifestations of the Hip-Hop scene. B-boying has transcended generations and cultures, transforming itself through time from a local subculture to a global phenomenon. And, unlike many subcultures that remain largely “underground”, B-boying is regularly on the mainstream, public stage. Dance competition TV shows and Hip-Hop and pop concerts often feature B-boy performances, raising the question: to what degree has B-boying adopted mainstream elements? Due to the correlation between Hip-Hop and the African American community, how does this social connection influence b-boy subcultural membership and identity? According to Joseph Schloss (2009), the close relationship between music and dance present in Hip-Hop demonstrates a “clear fusion” of African American and Latino culture (Schloss 2009). B-boys establish much of their musical and breaking concepts in Latin elements, such as the clave. The integration of music, mind, and body in rhythm patterns reveals an approach to dance that is rooted in the African diaspora throughout the Caribbean (Schloss 2009). For DJ Disco Wiz, relating his DJing style back to his Puerto Rican and Cuban roots was a result of not only his own DJing style and the close relationship between Latino culture and Hip-Hop (Reznowski 2014). Shortly after its inception, B-boying (and Hip-Hop, in general) became closely associated with the African American and Latino populations of New York City. 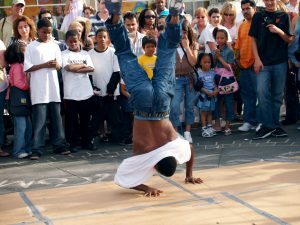 As B-boying began to popularize, news and media sources would utilize terms such as “street” or “ghetto” to describe the phenomenon of breakdancing, rather than overtly reference race and ethnicity (Fogarty 2010). The dance community came to understand breakdancing (and other dance forms from minority/ immigrant communities) as ‘low brow’ in comparison to the ‘high brow’ European dance practices (Fogarty 2010). However, as B-boying continued to grow in popularity and on the international stage, Caucasians began to adopt and identify with the B-boy culture more and more. Often, this meant rejecting middle-class whiteness and “adopting the ghetto” – only for white participants, adopting the ghetto did not include the “oppressive baggage attached to black youth who [also] adopt such an image” (Brayton 2005). As a result, in the Hip-Hop, and therefore B-boy scene, race became a contributing factor to the perception of authenticity; however, it is not the only, or the sole, determining element. The B-boy subculture grounds authenticity is in dancing prowess, musicality, and subcultural knowledge. Despite the global nature of b-boying, the subcultural capital of music and breaking prowess unites b-boys around the world – regardless of nation lines. According to Kong (2010), B-boys today clearly see the connection between breaking and the “natural spontaneity” of the art form and its historical elements (Kong 2010). In this art form, understanding, recognition, and use of the past to influence actions and dance performance is a critical element of authenticity. Furthermore, language also plays an important role in determining subcultural capital and reflecting authenticity. Understanding the meaning and use of terms such as “battles,” “crews,” “toprock,” and “freezes,” for examples, serves as a social marker to create distinctions among subculture members (Fogarty 2010). B-boys around the world experience a sense of unity as a result of the universal elements of sub-cultural capital, such as terminology and appreciation for Hip-Hop history. Through socialization into the Hip-Hop scene, B-boys learn the values of the breaking community, such as originality and inventiveness. These standards applied to both dance technique and personal appearance. B-boys must present a distinct “breaker identity” through the process of impression management; this includes changes in clothing, attitude, and name to reflect personal characteristics and expertise (Fogarty 2010). Today, the use of subcultural capital is much more significant in establishing a sense of authenticity within B-boying, than race and ethnicity; however, during the early years of breaking, race and ethnicity played an important role in subcultural membership. The perception of the B-boy scene as predominantly male results in a gender divide for B-boys and B-girls. Female breakers face sexism and gendered expectations as a result of the “man’s world” of B-boying (Ogaz 2006). B-girls challenge and defeat the gender stereotypes of breaking through their skills. However, the performances of female breakers by others in the B-boying community, as a result of their gender. Furthermore, because men are often the ones who train B-girls, female breakers frequently do not receive credit for their skills — rather, their male trainers receive this recognition (Fogarty 2011). Today, most breaking crews consist of only men, or all men and one woman. Subsequently, to navigate the male dominated environment, B-girls establish female only crews (Fogarty 2011). As a result of the small faction of B-girls, female dancers establish imagined affinities – “identification expressed by a cultural producer who shared an embodied activity with other practitioners through their mediated texts or travels through new places” — with one another to sustain B-girl networks and culture (Fogarty 2007). B-girl presence in B-boying questions gender expectations and performance. The B-girl presentation of breaking constructs a hybridity between masculinity and femininity that challenges traditional perceptions of gender (Langes and Fasting 2017). Female breakers face constant comparison to B-boys; however, through impression management, B-girls present unique “gender crossing” identity characteristics, develop deep connections with fellow female breakers, and establish an environment and authority for women in breakdancing. An Independent documentary on the history and culture of b-boying in the global context. This documentary focuses on the culture of b-boying, its history, and its nature as a global phenomenon. It is also centers on the 2005 b-boy Battle of the Year (BOTY), an international, annual breakdancing competition that began in 1990. Planet B-Boy is focuses on the BOTY experience of five crews from America, Japan, France, and South Korea, and their quest to win the competition. This documentary also features interviews from iconic b-boy Ken Swift of the Rock Steady Crew. The Freshest Kids details how b-boys shaped the current Hip-Hop culture and pioneered a new art form. This documentary features interviews with original players in the B-boy movement, including Afrika Bambaataa and DJ Kool Herc. Additionally, The Freshest Kids includes interviews with current rap artists, such as Mos Def and Redman, who discuss the significance of the initial innovators of the Hip-Hop scene. Beat Street is a Rhino Entertainment film about a South Bronx graffiti artist who paints a backdrop for a rap/B-boy battle. Afrika Bambaataa, the Rock Steady Crew, DJ Kool Herc, and Grandmaster Melle Mel & the Furious Five are all included in this film in various roles. The graffiti documentary Style Wars inspired parts of the Beat Street plot. An Orion Films picture about a South Bronx DJ trying to become successful in show business. Seminal graffiti artist Lee Quinones plays the main character, Zoro. Also included in the film: original breakdancing, freestyle MCing, and rare footage of Grandmaster Flash DJing. Various influential Hip-Hop figures discuss the inception of Hip-Hop in New York City. This video is part of a larger eight-part series entitled “Soundbreaking” that discusses the evolution of music recording. DJ Kool Herc is one of the founding members of Hip-Hop and is recognized as one of the members of the “Holy Trinity of Hip-Hop.” In this video, he describes how he invented playing two breakbeats together, as a continuous song. Like DJ Kool Herc, Afrika Bambaataa is a member of the “Holy Trinity of Hip-Hop”. This video illustrates both the b-boy subculture and the foundational music of Hip-Hop. In this interview, he describes the culture of Hip-Hop during its early years compared to the current (1990s) community. Grandmaster Flash was a central figure in the Hip-Hop and DJing world during its inception in the late 1970s. In this video, he demonstrates the break mix technique. This video features top b-boy crews from South Korea, demonstrating the widespread popularity of b-boying around the world. This video features b-boys from Brazil, both demonstrating the essential ties of b-boying with Latin culture and the globalization of b-boying. Hager, Steve. 1984. 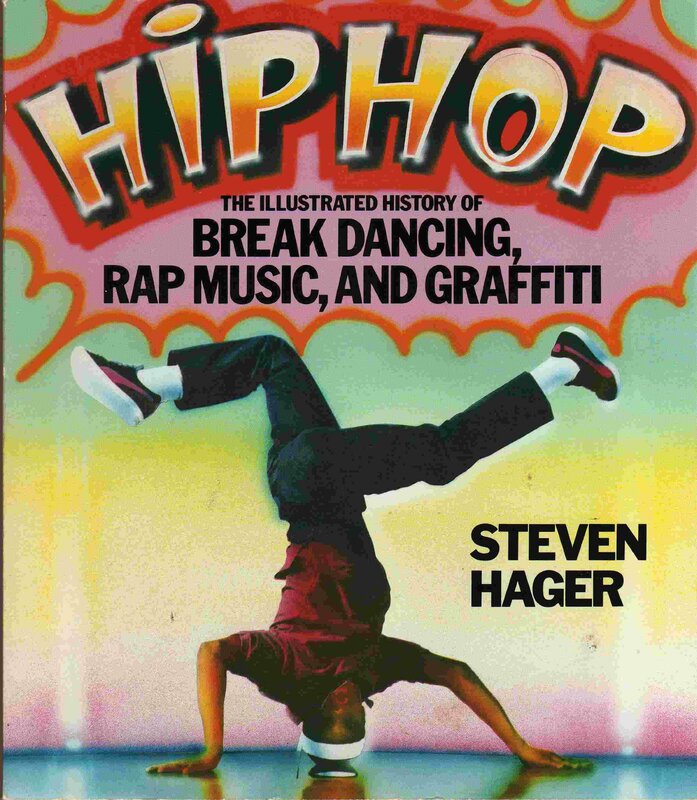 HipHop: The Illustrated History of Breakdancing, Rap Music, and Graffiti. New York, NY: St. Martin’s Press. 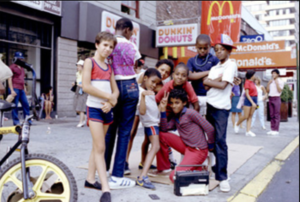 This book, written by a New York Times reporter, offers a history of Hip-Hop (B-boying, graffiti, rapping, and MCing) in the Bronx and Brooklyn. 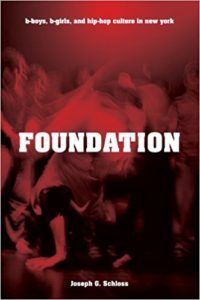 This book includes information on some of the most vital B-boy elements, such as street battles, street performances, the inextricable connection to Hip-Hop, and more. Mitchell, Tony, ed. 2001. Global Noise: Rap and Hip-Hop Outside the USA. Middletown, CT: Wesleyan University Press. 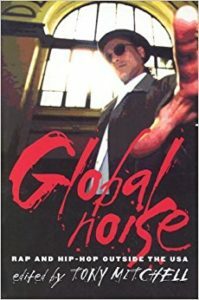 This book is comprised of thirteen essays that explore Hip-Hop scenes in Canada, Europe, Japan, and Australia and demonstrate that other forms of Hip-Hop were created by first adopting the U.S. model then establishing a hybridity with local language and musical features. In this book, Mitchell skillfully demonstrates the vastness of the B-boy community and the interconnectedness that is felt, regardless of cultural differences. Ogaz, Charla. 2005. “Learning from B-Girls.” Pp. 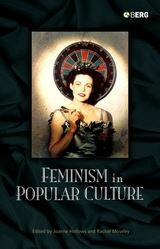 161-182 in Feminism in Popular Culture. New York, NY: Berg Publishers. Schloss, G. Joseph. 2009. Foundation: B-boys, B-girls and Hip-Hop Culture in New York. New York, NY: Cambridge University Press. 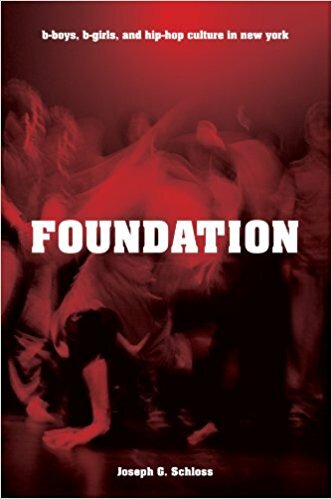 Through this book, Joseph Schloss conducts an in-depth examination on the foundation of B-boying in the Bronx. Additionally, Schloss provides a nuanced study of B-boying in its social context. Foundation successfully presents analysis on B-boying itself, as well as in the larger Hip-Hop community through intentful scrutiny of musical repertoire, education style, and street battle performance. Fasting, Kari, and Tonje F. Langnes. 2014. “Identity Constructions among Breakdancers.” International Review for the Sociology of Sport 51(3): 349-364. This article discusses the evolution of Hip-Hop from the Bronx to a global phenomenon. Through eight months of ethnographic research, Fastings and Langnes demonstrate the processes of identity construction and management among breakers. 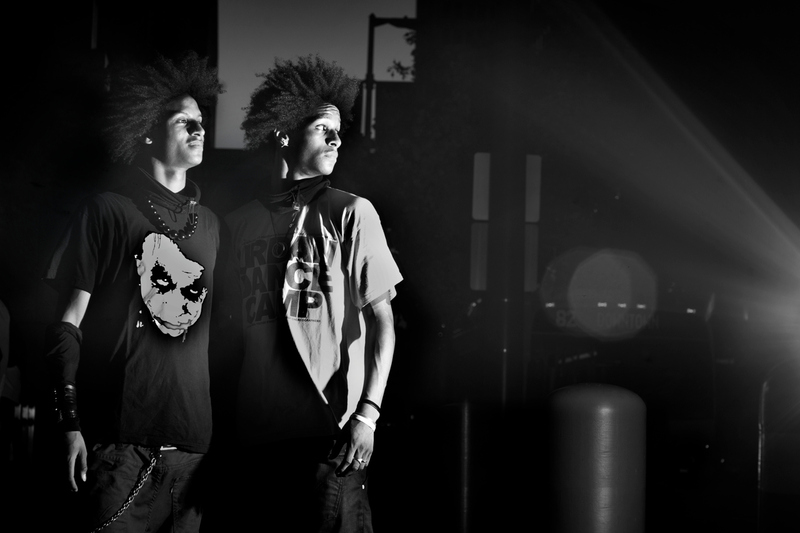 Their ultimate goal is to highlight the “liberating potential” of breakdancing. Fogarty, E. Mary. 2010. “Learning Hip Hop Dance: Old Music, New Music and How Music Migrates.” Pp. 66-85 in Crossing Conceptual Boundaries II. London, England: University of East London. In this chapter of Crossing Conceptual Boundaries, Mary Fogarty discusses the role of music in B-boying. More specifically, Fogarty analyzes the evolution of breakers music taste as they learn and transform their dance skills. Fogarty places an emphasis on the relationship between teacher and student in creating a cross-cultural shared understanding of breakdancing. Fogarty, E. Mary. 2011. “Dance to the drummer’s beat: competing tastes in international B-Boy/B-Girl culture.” Doctoral Thesis, Department of Dance, University of Edinburgh. This thesis analyzes the relationship between dance practices and music tastes within B-boying. To demonstrate this relationship, Fogarty conducted interviews with a wide array of B-boys/B-girls, in order to present a multi-generational, multicultural account of the scene. Fogarty, E. Mary. 2016. 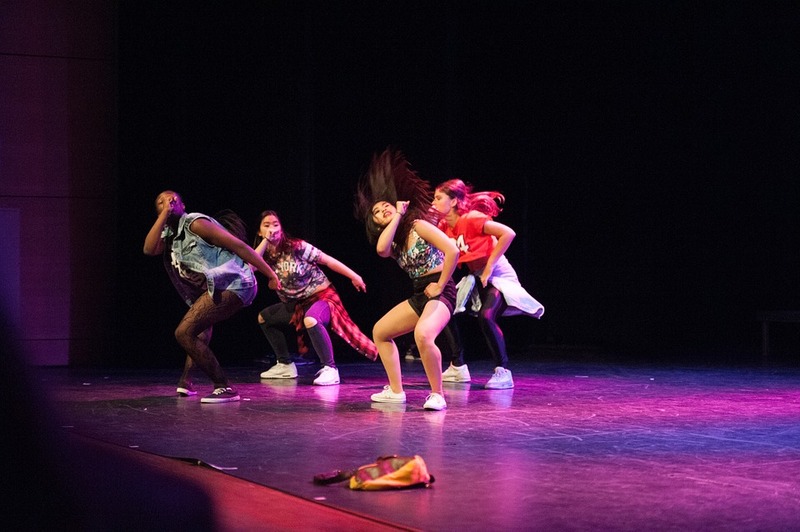 “Spontaneous Lux: Freestyling in Hip Hop Dance and Music.” Music and Arts in Action 5 (1): 70-79. This article by Mary Fogarty discusses the importance of “freestyling” (improvisation) in the B-boy and Hip-Hop culture. Fogarty presents an ethnographic analysis of the freestyling rap form of the West Coast and the distinct breaking styles of Toronto, Canada. Holmes-Smith, Christopher. 1997. “Method in the Madness: Exploring the Boundaries of Identity in Hip-Hop Performativity.” Social Identities 3(3): 345-374. In this article, Holmes-Smith evaluates the role of identity construction in the Hip-Hop scene. In particular, Holmes-Smith focuses on the role of race and social class in identity management and presentation among Hip-Hop subculturists. While this article centers on MCing, the art of breaking is discussed, as well. Knox, M. Joseph. 2010. “Breakdance Corrupted B-Side Story: Resurrecting Authentic Bboying Through Live Music.” Thesis, University of California, Irvine. This thesis, Knox discusses the role of B-boying in modern society. Furthermore, he demonstrates the evolution of B-boy mentality that has occurred as a result of the transition from live music to DJ. Kong, Dehui. 2010. “Internet Killed the B-boy Star: A Study of B-boying Through the Lens of Contemporary Media.” Senior Seminar Thesis, Department of Dance, Barnard College, New York. In this thesis, Kong reflects on the influence of the Internet and mass media on B-boying. From dance education to the dissemination of breaking performance, the Internet has had an undeniable impact of B-boy culture. Kong questions how the Internet and mass media has led to the ‘mainstreaming’ of B-boying. Reznowski, Gabriella. 2014. “Hip-Hop Mundial: Latino Voices, Global Hip-Hop, and the Academy.” Pp. 85-94 in SALALM Secretariat. Latin American Library, Tulane University. This chapter by Gabriella Reznowski focuses on the Latino influence in the Hip-Hop and B-boy scene. Reznowski traces the Origins of B-boying throughout Caribbean, African, African American, and West Indian history to demonstrate the multicultural reality of B-boying. NPR. 1984. “Hip Hop Hooray: Breaking into the Big Time.” Retrieved Sept. 14, 2017 (http://www.npr.org/programs/morning/features/patc/breakdancing/article.html). Village Voice. 1998. “Breaking’s New Ground.” Retrieved Sept. 13, 2017 (https://www.villagevoice.com/1998/05/26/breakings-new-ground/). In this 1998 article, Frank Owen discusses the increase in popularity of Hip-Hop, and B-boying, in particular. Owen examines the expansion of break dancing into New York night clubs and the impact this popularity has on the “look” of the B-boy scene.